CourseLeaf Curriculum Information Management (CIM) takes the entire curriculum process online, integrates, and builds on the CourseLeaf Catalog software (CAT) to provide a comprehensive Curriculum and Catalog product. 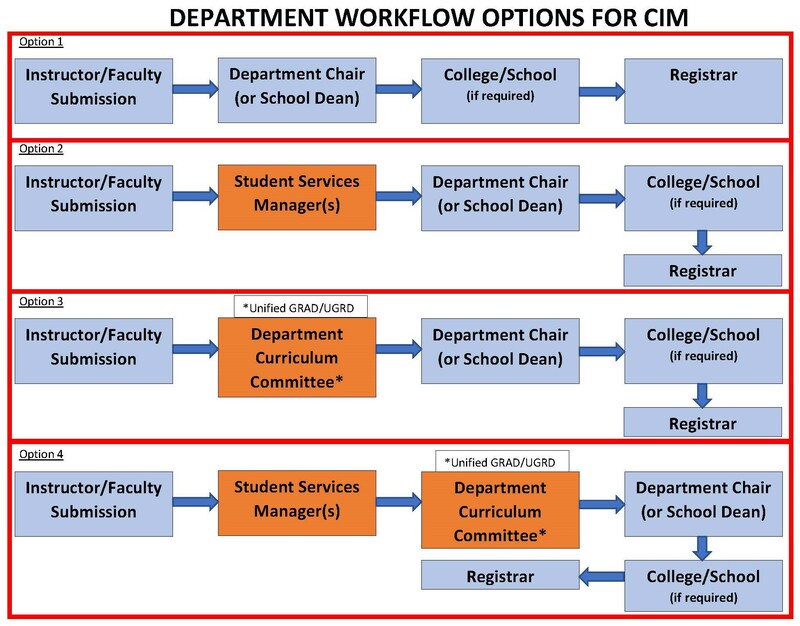 CIM Course Approval is tightly integrated with the University Catalog and ConnectCarolina. The CIM module will import course information from ConnectCarolina, provide customized pre-populated forms for campus users (e.g., faculty, administrative staff) automatically create workflow, identity all affected courses by the proposed change, track edits and comments, report on status, generate customized PDF files on demand for committee meetings, and assist in automatically updating ConnectCarolina at the end of the process. The CourseLeaf Catalog software (CAT) will then automatically update the next University Catalog with the approved ConnectCarolina course data. Navigate to “My Schedule” in your Faculty Center. Click on the link CIM: Propose or Revise a Course. Staff may access CIM by navigating to: https://nextcatalog.unc.edu/courseadmin/ (feel free to bookmark this page). Login with your UNC Onyen and Password. The CIM system is very user-friendly with many built in features to guide you through the form. Hover over the help bubbles on the form for more information. CIM’s online Help (must be logged in to CIM to access — courseleaf.com/cim/) provides even more assistance. The guidelines and deadlines detailed in the links below are intended to meet the annual publication and update cycles for the University’s course catalog and general catalog. Course changes, including course revisions and new course requests, will only be accepted until the course schedule is posted (for undergraduate courses) and the registration open date (for graduate courses) for a given term. Please see the CIM deadline calendar for further information. Once students are enrolled in a course, further changes are not allowed due to the impact on students, billing, and course enrollment policies. Any exceptions to the guidelines and deadlines posted below will require chair’s approval and justification and will only be allowed for exceptional circumstances. CIM utilizes workflow technology that allow course requests to move sequentially from submitter through the approval process. To view the current workflow steps for your unit, click here. For technical support with ConnectCarolina, ONYEN, or other computer-related issues, contact the UNC Help Desk (unc.edu or 919-962-HELP). For support in using CIM, email curriculum@unc.edu. For information on submitting undergraduate courses in CIM visit unc.edu/curriculum-proposals/cim/. Questions may be directed to Nick Siedentop (nick_siedentop@unc.edu) or Ben Haven (bhaven@email.unc.edu). For questions regarding courses in the Graduate School contact Stephanie Schmitt (sschmitt@email.unc.edu). For questions regarding graduate-level in other professional schools, email curriculum@unc.edu.